Most video projectors these days can boast an HD Ready badge, but the high-end Full HD club is currently much more exclusive, and to get in, you have to pay - hence the rather dizzying price of the VP11 S1. Once admitted, though, you're mixing with the cream of video projection, like the Sony Ruby, SIM2's Domino D80 and JVC's D-ILA HD1, all of which flaunt a native resolution of 1920 x 1080. These, of course, are the magic numbers that guarantee high-def footage is seen at its eye-watering best, with no scaling, cropping or compromising allowed. There's no shortage of competing technology to deliver Full HD (LCD, D-ILA, SXRD) but the Marantz reviewed here uses single-chip DLP, by far the most successful front-projection format. Using tiny mirrors, which swing to either reflect or deflect light beams that make up the image, DLP's inventor Texas Instruments has been able to convincingly dominate the global projector market. 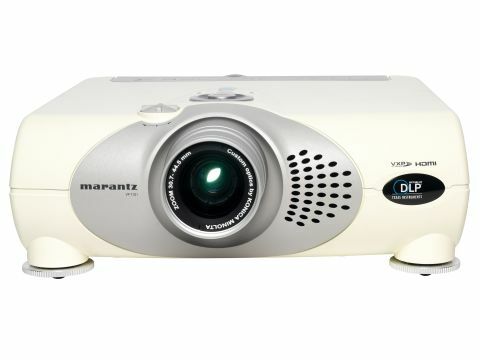 Marantz is probably best-known for its hi-fi heritage, but the brand also has a long history with DLP projectors, positioning itself at the high-end of the market. The VP11 S1 continues that stance. Although perhaps disappointing to note that this model isn't a three-chipper, it is extraordinarily versatile, and has optics courtesy of Konica Minolta. The VP11 S1 is a home cinema projector through and through. Its massive, uncompromising aluminium chassis - which looks a bit like the Millennium Falcon if you squint - is designed to reduce vibration and eliminate running noise in a sound-proofed cinema room and its hefty size means that a permanent ceiling mount is really the only way to install it. The lamp isn't especially bright and the contrast is predictably hopeless in daylight conditions, but in a properly dark cinema room, it will dazzle. At almost an inch wide, the DLP chip itself is physically larger in this incarnation, and that means a bigger picture. Up to 250 inches in diameter in fact. ere's a full compliment of connections on the back, including two component video inputs, a VGA connection for a PC and two HDMI sockets. For the best results, you'll want to use the HDMI connection. Setting up the VP11 S1 is made easier by the excellent remote control, with fully back lit buttons and the no-nonsense on-screen graphical user interface. Zoom and focus are manual adjustments, while optical lens shift is a button press on the remote. You have digital keystone correction to line the image up as well, but it's always best to avoid using this kind of image manipulation if possible. When you're up and running and calibrated to a satisfactory degree - I used Digital Video Essentials - the reward is worth the effort. High-def material, for which this projector is best used, looks stunning. The VP11 S1 will upscale all incoming images to 1080p, but given a 1080p source, in this case a Sony PS3, and spectacular Blu-ray footage, such as Planet Earth, and you'll see exactly what this projector is capable of. The BBC really pushed the limits with Planet Earth, recruiting 70 producers and camera operators to capture the natural world in high-definition over a five-year period. Much of it was filmed in 1080p using a Sony HDC-950 camera on a Cineflex heligimbal attached to a helicopter. The resulting aerial camera pans over snowy mountain peaks are breathtaking, and it takes a projector like the Marantz to do them justice. Even when standing close to a 9ft screen, you can barely make out the pixel structure of the projector and you certainly don't see any jaggies or pixel blocking. The contrast here is excellent and you can clearly make out the folds of snow in the white landscape. Particularly dark scenes are more of a problem for DLP projectors in general, and even the VP11 S1 struggles to display pure black. So where the Marantz really shines is during the more colourful scenes. The brand has beefed-up the colour wheel to seven large segments to squeeze out even more vivid colours and extended the red segment, which is traditionally the most difficult colour to reproduce. The result is a massive improvement over previous models. Getting back down to earth with some standard-definition material is a good way to test the scaler inside the VP11 S1. Stepping down from high-def to standard-def is always disappointing, but the smooth lines and sharp images from DVD demonstrate how accurately the extra lines of information are being added. At the end of the day though, there's no substitute for raw resolution. Buying a projector at this end of the market is a big decision and, with the technology moving apace, it's a risky business. Anyone who bought a non-HD Ready projector recently will know what I mean. Yet, now that things seemed to have settled down a bit and 1080p has arrived as the upper limit for video resolution, a top-spec projector that performs as well as the VP11 S1 is a very safe investment. Highly recommended.